This guide gives details of what you should do when taking over a payroll mid way through the year i.e. where the payroll has previously been processed by someone else /other software/another accountant etc. We recommend that you read through the whole guide first before beginning data input, as there are a number of different options and possibilities depending on the type and quality of information that you can obtain from the previous payroll processor/software. The weekly/monthly pay dates for the employees. If the employer is a limited company that has suffered CIS deductions during the tax year you will need to obtain the total amount of deductions suffered in the year to date so far. Details of any Attachments of earnings, Deductions of earnings orders etc. A schedule of future payments for employees that are currently on parenting leave (SMP, SPP) and for whom these payments have already been calculated. P45 details of any employee that joined during that tax year. It is important that you obtain the correct information from the previous payroll processor. All FPS returns contain year to date figures for each employee, so the data that you use must be complete and accurate. If for some reason you are unable to obtain year-to-date information for an employee(s) then you should contact HMRC for advice on how to proceed. Click ‘File‘ then ‘New‘ from the main menu in Payroll Manager and choose the option to ‘Create a new blank file‘. Enter the name of the employer and select the appropriate tax year. After saving the file you will be asked whether or not the employer is eligible to claim the ‘Employment Allowance’, and then to specify the weekly/monthly pay dates as applicable. Once the file has been created you should click ‘Employer‘ then ‘Employer Details‘ from the main menu in Payroll Manager to continue adding employer-specific information. You should ensure that the HMRC PAYE reference and Accounts office reference’ are completed correctly as these are required in order to file RTI returns. If the employer is a limited company that has suffered CIS deductions during the tax year then enter these amounts by clicking ‘Employer’ then ‘CIS Suffered’ from the main menu in Payroll Manager. 3 – Add Pension scheme information (if applicable for that employer). If the employer has a workplace pension then details of the scheme should be entered before adding employee information. Click ‘Pensions‘ then ‘Pension Scheme Details‘ from the main menu. We have a number of guides specific to each pension provider to assist with the setup – see the moneysoft.co.uk/support-categories/setting-up/ page in the support section of our website to access these guides. 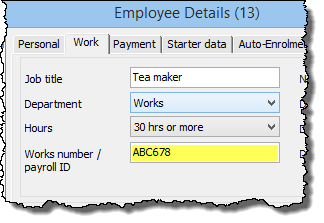 4 – Add details of each employee. The ‘Start date’ of the employee should be their actual start date with the company, and not the date that that you are starting to use Payroll Manager. You should include all employees that have been paid in that tax year, even if they have subsequently left. This is very important, as the year to date figures for leavers are relevant when calculating the ‘Employment Allowance’ for future periods. If the employee joined during the current tax year then you should include their P45 details in the ‘Starter Data’ section of the ‘Employee Details’ screen if they provided a P45 when joining. HMRC use a number of items to identify an individual – their Name, Date of Birth, National Insurance number, address, and where present, something called the ‘Payroll ID’. The Payroll ID is an optional field that can be used to identify the ’employment’ of an individual within an organisation. It is not mandatory to use a Payroll ID and as such, Payroll Manager does not automatically assign an ID to each employee. However, if a Payroll ID has already been used for an employee in a previous RTI submission (perhaps by the previous software/payroll processor) then it is vitally important that the same Payroll ID is used in subsequent RTI submissions. Failure to do this may lead HMRC to (wrongly) assume that this is a totally different individual, leading to errors and possible duplication of HMRC records. You should establish whether or not a Payroll ID has been used for this employee in a previous RTI submission, and if so, ensure that the exact same ID is used in Payroll Manager. If the previous processor/software did not use a Payroll ID then it is fine to leave this field blank. As far as we are aware, Sage software automatically generates a 32 character Payroll ID for each employee, so if the payroll was previously processed using Sage you should ensure that this information is entered correctly. If the previous payroll processor was using HMRC Basic Tools they can find the Payroll ID under ‘Employee Details > Employment Details > Payroll ID’. You should be aware that some software may use both a ‘works number’ (often displayed on the employees payslip) and also a separate ‘Payroll ID’ (used in RTI returns) and so you should be careful to ensure that it is the ‘Payroll ID’ that you enter into Payroll Manager. There are two methods of entering the year to date employee payroll information, and you must choose one of these methods and then apply this to all employees. The two methods are ‘Pay period by pay period‘, and ‘Mid Year Start‘. ‘Pay period by pay period‘ – Using this method you enter all details, period by period from the beginning of year on the ‘Pay Details’ screen. This is sometimes the easiest method to choose if you have a small number of employees and have complete pay records for each individual pay period. 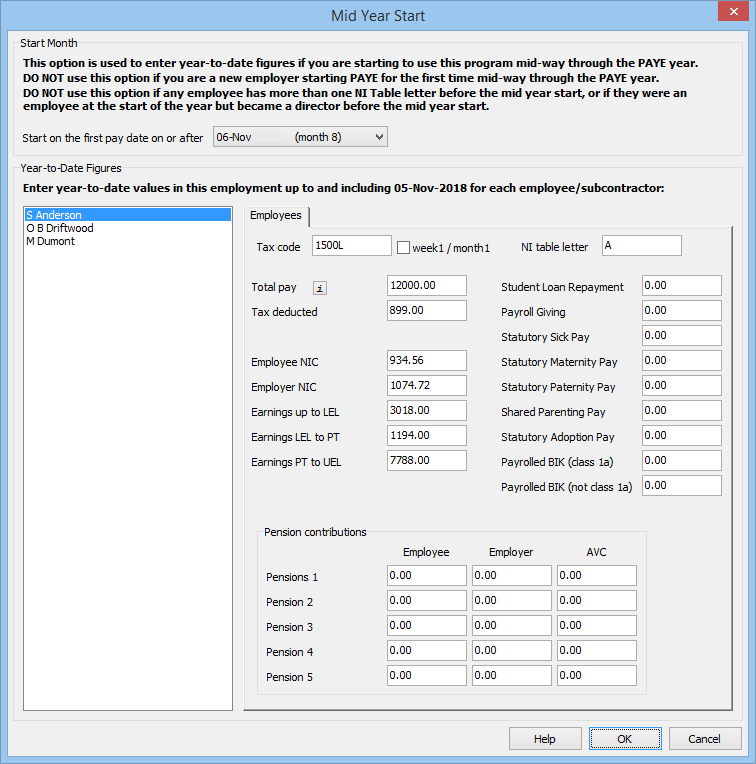 Mid Year Start‘ – Using this method you enter the ‘Year to date’ totals for each employee, rather than individual pay period amounts. This method is useful if you have a large number of employees and/or are starting late in the year as it reduces the amount of data that you need to enter. The year to date figures required include items such as employee pay, tax, employee and employer national insurance, together with a detailed breakdown of their earnings between the various National Insurance pay bands. These figures can be found on a ‘P11 deductions working sheet‘ (or equivalent) which you should obtain from the previous payroll provider/software. (Important: It is not possible to use the ‘Mid Year Start’ method if you have an employee that has had 2 or more different NI table letters in operation during the year to date, or if they became a director mid way through the year. In such cases you would need to use the ‘pay period by pay period’ method instead. Note – both of these methods rely on you having obtained sufficient information from the previous payroll processor. If for some reason you are unable to obtain year-to-date information then you should contact HMRC for advice on how to proceed. If you have chosen to use this method then go to the ‘Pay details’ screen and enter data for all previous pay periods, starting with the first pay period of the tax year. When you have finished entering information for all employees go straight to section 6 of this guide. If you have chosen this method then click ‘Tools‘ then ‘Mid Year Start‘ from the main menu in Payroll Manager. You should first specify the relevant tax month from the ‘Start on the first pay day on or after‘ drop down selector. Note that you must choose a starting month (regardless of whether the employees are paid weekly, monthly or otherwise). The first time that you do this the software will ask ‘are you sure you want to change this’ – you should answer ‘Yes‘ to this question. If the employees are paid monthly and you have year to date figures up to and including October (month 7), then you should select ’06-Nov (Month 8)’ as the Mid Year Start date. If the employees are paid weekly and you have year to date figures up to an including 30 November, then you should select ’06-Dec (Month 9)’ as the Mid Year Start date (as 30 November was the last weekly pay date in month 8). Complete the appropriate fields on the mid year start screen by referring to the P11 deductions working sheet for that employee. Please note that it is the year to date figures for this employment that should be entered on the ‘Mid Year Start’ screen and you should not include figures for any previous employments. If an employee joined with a P45 from a previous employer in this tax year then the previous pay and tax information should be entered on the ‘Employee Details – Starter Data’ screen instead. Tax code – the current tax code – i.e the one that was used to calculate tax the last time that the employee was paid. NI table letter – the current NI table letter – i.e the one that was used to calculate national insurance the last time that the employee was paid. Total pay – this should include any pay that is taxable* or NICable and must include any amounts entered as employee pension contributions, but must exclude any payrolled expenses and benefits. (*That is the taxable pay before the deduction of any tax-free pay). Employee NIC – The total employee NIC in the year to date. Employer NIC – The total employer NIC in the year to date. Note: sometimes the P11 deductions working sheet does not contain a separate column for ‘Employer NIC’, but will instead have a column for the sum of the ‘Employee + Employer NIC’. In such cases you should manually calculate the employer NIC by deducting the ‘Employee NIC’ from that combined total. Earnings up to LEL – The ‘LEL is the ‘Lower Earnings Limit’. In 2019-20 the LEL is £118 for weekly paid employees, and £512 for monthly paid employees. e.g. If you have year to date figures for a monthly paid employee up until and including month 7, and if that employee’s earnings exceeded £512 in each of these previous 7 months, then the ‘Earnings up to LEL’ figure will be 7 x £512. If the employee did not reach the LEL in any one pay period then the ‘earnings up to LEL will be lower than this amount. Earnings LEL to PT – PT stands for ‘Primary Threshold’. In 2019-20 the PT is £166 for weekly paid employees and £719 for monthly paid employees. The year to date ‘LEL to PT’ figure should be read from the P11 deductions working sheet and entered into this field. Earnings PT to UEL – UEL stands for ‘Upper Earnings Limit’. In 2019-20 the UEL is £962 for weekly paid employees and £4167 for monthly paid employees. The year to date ‘PT to UEL’ figure should be read from the P11 deductions working sheet and entered into this field. The year to date totals for Student Loan Repayment, Payroll Giving, Statutory Sick Pay, Statutory Maternity Pay, Statutory Paternity Pay, Shared Parenting Pay and Statutory Adoption Pay should be completed if applicable for that particular employee, otherwise they can be left as zero. Payrolled BIK (class 1a) and Payrolled BIK (not class 1a). – If the employee is in receipt of expenses/benefits that the employer has chosen to ‘payroll’ then the appropriate year to date figures should be entered here, otherwise leave these fields blank. Pension contributions – this section allows you to record the year to date totals for up to 5 pension schemes per employee (although typically only one or two will be in use). Enter the employee and employer pension contributions for that employee, and also any ‘Additional Voluntary Contributions (AVC)’ that may have been made (which will often be zero). Repeat this procedure for all employees before clicking ‘OK‘ to save and exit this screen. 6 – Start processing the payroll for the current pay period. Once you have entered the employer details and pension scheme details, have added each employee and entered the year to date pay information then you are ready to start processing the payroll as normal. When you come to file the first RTI return for that employer you will see that Payroll Manager has scheduled an ‘EPS’ on the ‘Employers RTI schedule’ to inform HMRC whether or not the employer is claiming the Employment Allowance in that tax year. You should always file this EPS regardless of whether or not a similar submission was sent earlier in the tax year. If you have chosen the ‘Pay period by pay period‘ method of entering year to date figures you will notice that Payroll Manager has scheduled an FPS for all pay periods from the beginning of the year. You should ignore these previous submissions and only submit an FPS from the first pay period that you are processing onward. At this point the software will ask ‘are you sure?’ – answer ‘Yes‘ and Payroll Manager will remove any previous FPS returns from the schedule. If you have chosen the ‘Mid Year Start’ method of entering data then Payroll Manager will only schedule an FPS from the first pay date following the mid year start date. Instead of manually entering employee data / year to date figures it is possible to import this information if you wish. In order to do this you must have complete and accurate year to date and employee details in a csv file format from the previous payroll processor. Importing data in this way replaces the procedures detailed in section 4 and 5 above. See our guide importing from other software if you wish to use this method. – What if my employees are paid weekly and my year to date totals are up to a pay period which is part way through a month (e.g 15th October)? In such cases it is not possible to use the Mid Year Start method, as this method requires that you enter year to date figures up until the end of a tax month. You can choose to either use the ‘Pay period by pay period’ method instead, or get hold of year to date figures for an earlier week which does coincide with the last pay period in a tax month. – How do I enter the amount of Employment Allowance that has already been used up in the year to date? – You do not need to enter this figure as it can be calculated automatically. 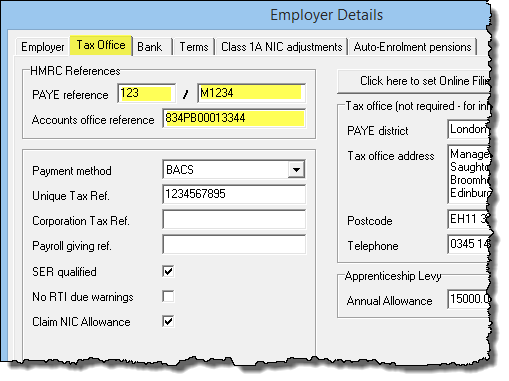 Payroll Manager adds up all of the Employer NIC (from either on the Mid Year Start screen or on the Pay Details screen, depending on how you have entered the figures) and compares the total to the Employment Allowance applicable to that particular tax year. From this, any remaining Employment Allowance that is yet to be claimed can be calculated.